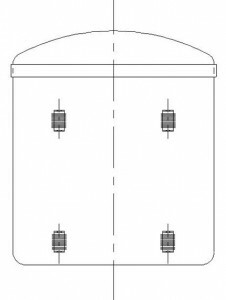 Flat Bottom tanks are the most common used tanks in the industry. All Flat Bottoms are designed in accordance with ASTM D-3299 or D-4097 standards. They are the most cost effective way to store product. The tank flat bottom requires a flat surface to give full support. After selecting the Flat Bottom design, selecting the right top is the next step of the process. Closed Dome Top – This is the most frequently requested top style. The ASME Flanged & Dished design gives it the most strength without adding thickness. Each domed top comes standard with a top manhole with loose cover. Closed Flat Top – A fixed, non-removable, flat surface. If head space is at a premium, if agitator rails are a requirement or flat walking surface is required, the Closed Flat Top may be the best choice. Open Top with 90°Top Flanged Rim – When a Flat Cover, agitator rails or full access to the tank is required, the Open Top with 90° Top Flanged Rim option is the best choice. Open Top with Type II Top Rim – When an open top will work and a Flat Cover and agitator rails are not required, this offers the most cost effective Flat Bottom tank design available. loped Bottom tanks are offered as both Internal and External. All Sloped Bottoms are designed in accordance with ASTM D-3299 or D-4097 standards. Internal Sloped Bottoms come standard with a 1” minor and bottom core to sit flat on your support pad. External Sloped Bottoms require the customer to provide a sloped support pad. Belding Tank’s standard pitch is ¼ inch per foot to allow drainage to the low side of the slope. Either bottom design requires full bottom support. After selecting the Sloped Bottom design, selecting the right top is the next step of the process. Cone Bottom tanks offer complete drainage. Belding Tank’s standard cone apex angle is 90°. All Cone Bottoms are designed in accordance with ASTM D-3299 or D-4097 standards for elevated cone heads. Cone Bottom tanks come standard with a primed carbon steel pipe leg stand with floor plates and a standard 18” under clearance from the tank bottom to the floor plates. Therefore, when complete drainage is an absolute must, the Cone Bottom design is the only choice. Leg stands can be provided as painted carbon steel, Fiberglass Reinforced Plastic (FRP), T-304 or T-316 stainless steel pipe legs or FRP skirt support, at additional cost. After selecting the Cone Bottom design, selecting the right top is the next step of the process. Dished Bottom tanks offer near complete drainage. All Dished Bottoms are designed in accordance with ASTM D-3299 or D-4097 standards for elevated ASME Flanged & Dished torispherical heads. Dished Bottom tanks come standard with a primed carbon steel pipe leg stand with floor plates and a standard 18” under clearance from the tank bottom to the floor plates. When head pressure is required at the output, the Dished Bottom design is the most cost effective choice. After selecting the Dished Bottom design, selecting the right top is the next step of the process. Horizontal tanks are a great choice when floor space is not an issue and head room is at a minimum. The Horizontal tank ends are ASME Flanged & Dished for added strength and capacity. Horizontal tanks come standard with a minimum of two primed carbon steel support saddles which provide a standard 12” under clearance from the tank bottom to the bottom of the saddles. Support saddles can be provided as painted carbon steel, Fiberglass Reinforced Plastic (FRP), T-304 or T-316 stainless steel, at additional cost.